Louisville, Kentucky native wins the NASCAR Camping World Truck Series Buckle Up in Your Truck 225. The Louisville native can pick out the spot in the garage where his family used to park its trailer for his Legends and Bandolero races on the quarter-mile track. He remembers gazing at track through car windows while driving past it to his next go-kart race. Even now, Rhodes will occasionally pull off the interstate just to have a look around and maybe snap a selfie before continuing on his way to ThorSport Racing’s shop in Sandusky, Ohio. “I just love this track,” he said. 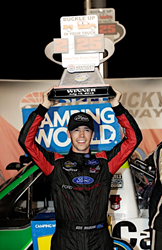 Rhodes added another memory Thursday by becoming the first Kentucky-born driver to win a NASCAR national series race at Kentucky Speedway. The 21-year-old rode old tires to a Camping World Truck Series victory in the Buckle Up In Your Truck 225 that he proclaimed as being sweeter than his first and only other series triumph. Rhodes’ truck carried the name of Louisville Metro Police Officer Nick Rodman, who was killed in the line of duty last year. It added to the significance of the evening’s accomplishment. “This race was a tribute to him and his memory,” Rhodes said. The No. 41 ThorSport Racing Ford was strong from start to finish. Rhodes started third, won the first and final stages, and led 38 of the 150 laps along the way. Stewart Friesen finished second in the No. 52 Chevrolet after starting at the rear of the field because of an engine change. Matt Crafton, who started 30th in the 32-truck field, finished third followed by Brandon Jones and John Hunter Nemechek. As happened in this race one year earlier, Rhodes won the first stage and pole-winner Noah Gragson won the second stage. In all, there were 11 lead changes among five drivers. Friesen took the lead from Parker Kligerman on Lap 88 and remained out front until pitting with 28 laps remaining. Rhodes was second at the time and held the lead until he pitted for fuel and chassis adjustments three laps after Friesen. Not taking tires on that final stop was a gamble, but one Rhodes’ crew chief was willing to take. Rhodes emerged with the lead after everybody pitted and Friesen followed him. He didn’t flinch and crossed the finish line 0.922 of a second ahead of Friesen for his second career victory in 62 career Truck Series starts. It was somewhat redemptive for Rhodes. Kentucky gave NASCAR the Waltrips, the Greens and Jeremy Mayfield. Rhodes is keeping that tradition alive and wants the climb up the NASCAR ladder to continue beyond the Truck Series.